Facebook has been in the news a lot lately but mainly due to its falling share price and how much money investors are losing in a matter of days, but today we have a Facebook phone concept for you to drool over. While many people in the world may not be ready for another Facebook themed smartphone, Cnet are reporting that designer Michal Bonikowski has still come up with a creation. The designer has come up with his idea on what addicts to the social networking site would love, and judging by the images below its a million miles away from the ill-fated offerings from HTC. The concept smartphone packs a 4.2-inch display and comes in the distinctive Facebook blue in a slab of a design with soft blunted edges, and the smartphone also features a unibody metal chassis along the lines of the HTC One V and HTC One S. The handset is aimed to be the ultra communicator device and would use an eight megapixel camera on the back, while around the front there would be a five megapixel unit for those quality video chats. This compares to the HTC Status or Cha Cha, which featured a plastic build with a small screen and tiny physical keyboard. The question is though will there be any demand for a smartphone such as this? If Mark Zuckerberg was to sanction a smartphone like this it would need to take a leaf out of the Nokia Lumia 900 book, and be priced aggressively. While we are seeing more integration of social networks on our smartphones, it makes you wonder if a device that mainly focussed on Facebook would appeal to a great number of consumers. Many apps that are available already allow users to easily connect to their social media accounts without too much fuss. 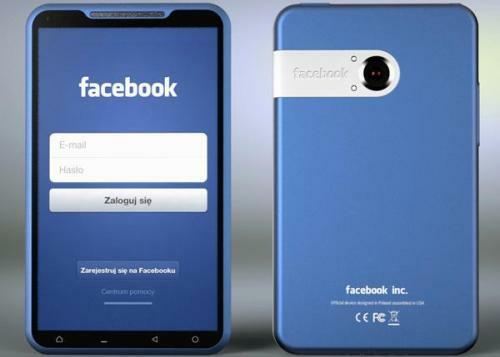 Do you like the idea of a Facebook branded smartphone? I think adult users who use the phone at work or at meetings would probably NOT want to be seen using a phone that distinctively spellout Facebook (with the blue metal jacket). However, if the target market is young users in high school or college, then the color as of now is fine. But then who in the right mind will want to limit their target market? iPhone is so appealing because its design is slick and discreet, suit all kinds of users.